If you were waiting for details of technical specifications from Jay Z’s big Tidal reveal in New York tonight, you’d have left disappointed. However, if you wanted to see 16 of the world’s biggest artists unveiled in person as the new “owners” of a digital music service, it would have been right up your street. So long as you weren’t hoping they’d say too much. After a brief introduction, probably the most glamorous Board Of Directors in the history of Boards Of Directors stepped out from the shadows and onto the stage. In order, they were: Alicia Keys, Arcade Fire (Win Butler and Régine Chassagne), Beyonce, Calvin Harris (on Skype), Chris Martin (on Skype), Daft Punk, DeadMau5, Jack White, Jason Aldean, J Cole, Jay Z, Kanye West, Madonna, Nicki Minaj, Rihanna and Usher. These 16 artists then signed a declaration – of what, exactly, was never made clear – in front of a whooping audience. And then, well, they left again. That, aside from a few words from Alicia Keys about the value of music, was pretty much that. What was more interesting from an industry standpoint was a short video played as the megastars went on their merry way. 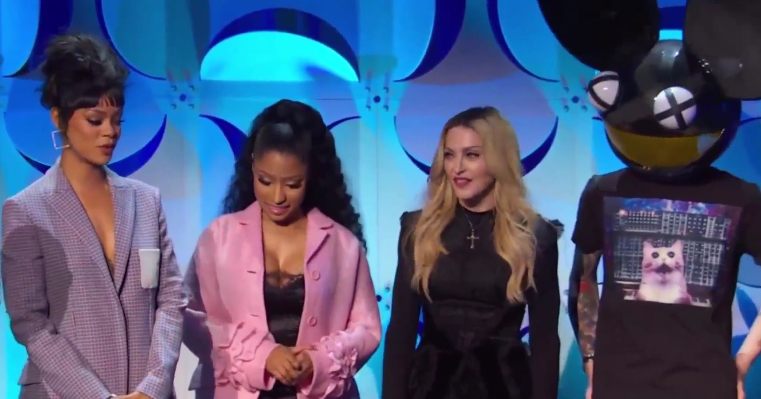 It showed the performers convening at a secret location earlier in the year, where they discussed the importance of an artist-owned distribution platform and their belief in the selling power of Tidal’s high-def audio. Below, you’ll find some of the choicest quotes from the video – a version of which you can watch at the bottom of this story. According to Billboard, Jay Z has given each of his 15 fellow artist owners 3% equity in the relaunched Tidal, in exchange for a pledge that they’ll bring exclusive material to the platform in future. The remaining equity in the company is owned by Jay Z, another investor and the record labels. It will be interesting to see how these artist exclusives play out. Most mainstream artists have signed record contracts with labels who may not be best pleased by attempts to scupper, say, an agreed exclusive launch window with Apple. And if streaming is a numbers game, Jay Z – whose €50 Euro takeover of Tidal parent Aspiro was finalised yesterday morning – definitely has his work cut out. Spotify currently boasts 15m paying subscribers and 60m total users, while Apple – expected to launch its streaming service in June – owns the credit card details of more than 500m customers. By contrast Tidal currently only has half a million paying subscribers around the world, with almost 400,000 of them coming via telco partnerships. As for Tidal’s high-end audio tier, just 17,000 people subscribed as of January – although following its recent rebrand, we can also add the 24,000 who paid for WiMP’s HD subscription to that tally. Jay Z will be hoping that, when you’ve got megastar after megastar queuing up to back you, those numbers clock up rather quickly.